Play therapy is a beneficial intervention used to help children make sense of difficult life experiences or complex psychological issues through the activity of play. Concerns addressed in play therapy include grief and loss, divorce, learning abilities, bullying, physical and psychological abuse, domestic violence, and other issues. Play therapy differs from regular play in that the therapist uses play to help the child address and resolve their own problems. The therapist and child interact with toys, board and card games, puppets, books, and other resources. 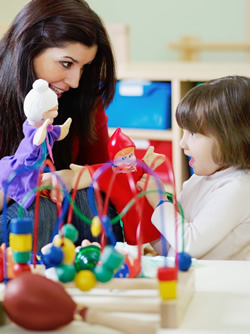 During play therapy sessions, the therapist is able to analyze the child’s play and gain an understanding of what the child is experiencing in his/her daily life. These sessions can last up to 50 minutes per week for at least 12 weeks or more depending on the child’s needs.